As a promoter of sustainable mobility, Alstom develops and markets systems, equipment and services for the railway sector. Alstom manages the widest range of solutions in the market – from high-speed trains to metros and tramways – customized services (maintenance, modernization,…) and infrastructure and signaling solutions. Alstom is a world leader in integrated railway systems. Alstom is present in over 60 countries and employs 31,000 people today. In every industry, development engineers strive for the best manufacturing and development processes in order to create the finest possible products. When searching for the perfect structural design solutions, they have to consider technical and economical aspects. Simulation enables them to achieve their goal and supports them in the entire product creation process. For this specific project, Alstom’s engineers were tasked with improving the design of an existing cast part. 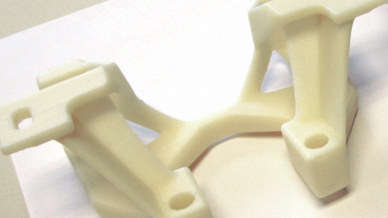 They wanted to optimize the part and specifically design it to be produced with metal additive manufacturing. Currently this part is used in Alstom's Metropolis units in the train bogies to support the anti-roll system. It turned out that the first design of the part seemed much too strong for the occurring workloads, and the finite element (FE) model revealed that the safety factor was also a little too high. As a first step, an analysis with Inspire® was carried out, providing the same results as the earlier FE analysis conducted with Altair® HyperWorks®. To improve the overall design while at the same time optimizing material usage, the optimization options were extended by increasing the design volume of the part, followed by a topology optimization. As a result of several iterations with Inspire, a customized solution was found, the exterior shape was then refined with Evolve®. The final geometry was then again verified with a detailed FE analysis. For the next step, which was already in progress, the team began preparing and analyzing the part to be additively manufactured. For this, Alstom collaborated with local 3D printing companies. 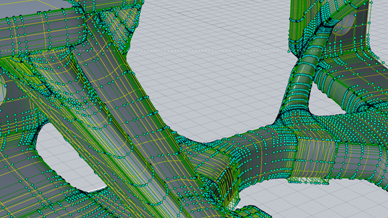 To handle their simulation tasks, Alstom Barcelona applies HyperWorks for meshing tasks, and to perform static FE analyses. For optimization and design tasks, the engineers rely on Altair's products, in particular Inspire and Evolve. These tools allow them to address issues such as material questions, geometrical derogations, and adjustments between the industrial processes and the designs. Before the engineers started with the re-design of a part used in the train bogies to support the anti-roll system, the existing design had been analyzed. Since the FEM model showed that the safety factor was a little too high, an analysis with Inspire was carried out, providing the same result. 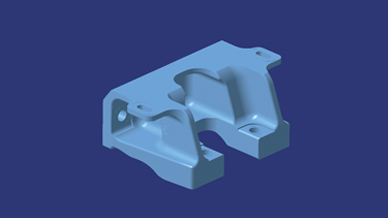 With the aim to improve the overall design while optimizing material usage, the design volume of the part was increased in order to extend the optimization options. For the subsequent topology optimization, the engineers first created a design space, then applied loads and other boundary conditions, and finally ran the optimization based on this input. Following several iterations with Inspire, in which the design space was changed and the team applied various different load cases and boundary conditions, a customized solution was developed. Finally, the exterior shape was refined with Evolve, and the compliance of this final geometry was verified again with a detailed FEM analysis. With the Altair solutions, Alstom has received very good results. "We are very satisfied with the results achieved. We have realized better designs and could fulfill all structural requirements in a shorter term. We plan on using these tools for a long time." Stated Juan Manuel Romero, Structures and calculation lead engineer at Alstom, Barcelona. The use of Inspire, Evolve and Altair HyperWorks’ solutions allows the engineers to complete the process and support structural tests. With their simulation driven design approach, which is enabled and supported by Inspire and the HyperWorks products, the engineers could drastically change the way products are developed. As a result, better products are developed in much shorter development circles. Additionally, the redesign of the part resulted in overall weight savings of about 70 percent. Alstom has been working with Altair products for 4-5 years, having established a development process for structural optimization and simulation using these products exclusively. The engineers at Alstom have a profound expertise in structural design and are combining simulation, tests, and the expected behavior in most of the situations to achieve the best possible result. 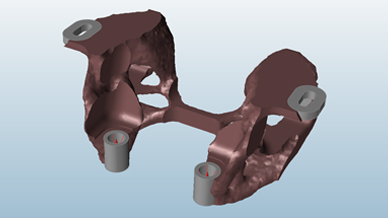 Optimization of an existing component design to be manufactured with casting or alternatively with additive manufacturing technologies. Simulation driven design approach with Inspire for topology optimization and Evolve for shape refinements.